-13- and legal counsel were all consulted. There was some feeling that such a question might be helpful for identification purposes, but it was generally agreed that such a question is not needed and could, legally, be omitted or blocked out of the form. 4) The Iowa City Board of Realtors were encouraged to change the wording of article 7 of their NAREB code on Minority Housing, so as t encourage Realtors to act positively in preventing discrimination. 5) [underline]Civil Rights Bill. 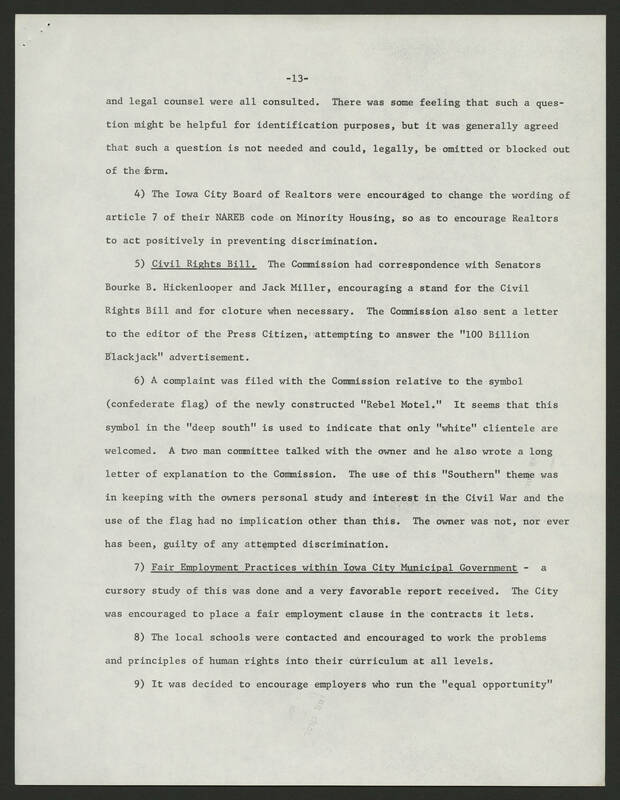 [end underline] The Commission had correspondence with Senators Bourke B. Hickenlooper and Jack Miller, encouraging a stand for the Civil Rights Bill and for cloture when necessary. The Commission also sent a letter to the editor of the Press Citizen, attempting to answer the "100 Billion Blackjack" advertisement. 6) A complaint was filed with the Commission relative to the symbol (confederate flag) of the newly constructed "Rebel Motel." It seems that this symbol in the "deep south" is used to indicate that only "white" clientele are welcomed. A two man committee talked with the owner and he also wrote a long letter of explanation to the Commission. The use of this "Southern" theme was in keeping with the owners personal study and interest in the Civil War and the use of the flag had no implication other than this. The owner was not, nor ever has been, guilty of any attempted discrimination. 7) [underline]Fair Employment Practices within Iowa City Municipal Government[end underline] - a cursory study of this was done and a very favorable report received. The City was Encouraged to place a fair employment clause in the contracts it lets. 8) The local schools were contacted and encouraged to work the problems and principles of human rights into their curriculum at all levels. 9) It was decided to encourage employers who run the "equal opportunity"